Gone are the days when the average turnaround time for software delivery used to be anywhere around a year or even a year and half! Today, when technology is advancing at such a rapid pace and what’s cutting edge technology today is turning obsolete at the blink of an eye, time becomes the most important defining factor. Interestingly enough, delivering the software product early is just a part of the deal, with an increasingly competitive market forcing organizations to focus on product quality and adding product value for the users. What’s more, there are several criteria that a software product has to meet before it can be considered for release in the market – effective performance across multiple browsers and platforms and running on both on premise and cloud environments, are just a few of them. With so many factors to take care of in order to make a software product ready for the market and ensure its success thereof, organizations are resorting to automation testing. If you’re wondering how it is the solution to the challenges of software product development, we have looked at its key benefits to organizations in the previous blog in the series titled Fundamentals of Automation Testing. Once you are convinced that it can indeed help you achieve the goals of product development, you need to take the required initiative to implementing it successfully. 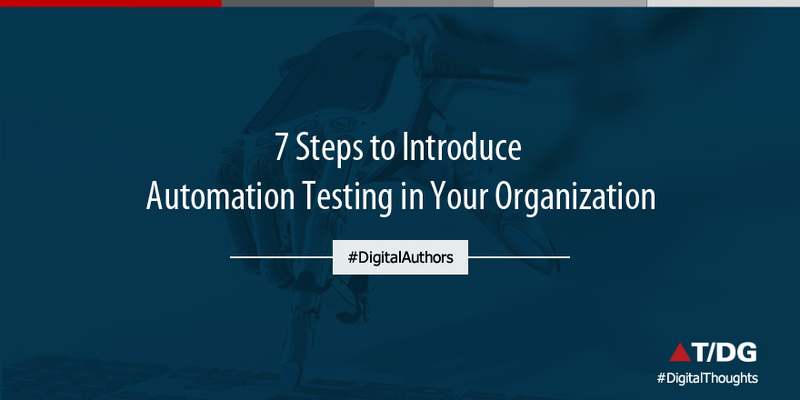 We have brought you a list of 7 steps to introduce automation testing in your organization. So, you’re convinced about the benefits of automation testing and wish to implement it to witness great results. But things aren’t going to work unless you have the decision makers of the organization on board – after all, implementing a new technology calls for investment and automation testing is no different. Add to it the fact that your organization would need to hire additional resources or at the least, invest in training the current QA team, and you have a significant investment to make. To convince the management, present them with a cost-benefit analysis that compares parameters like the time required for test execution, efficiency, accuracy among others, before and after implementation of automation, to show how the benefits justify the initial investment. Once you have the decision makers on board, you’re ready to move on to the next step which is to go ahead and find experts who can implement automation testing. The popular practice is to hire a test automation architect and a few automation engineers to work under his guidance. Automation architects are senior professionals with the expertise to design automation frameworks for your project and create the rules for scripting. Since they have the experience of working with different automation tools, they can also help in choosing the right tool for the application. Automation testing engineers, on the other hand, are professionals who will be writing the test scripts to automate the manual test cases. The budget allocated by the management for implementation. The decision to hire trained professionals or train the current resources. If it is the latter, your preference should be a tool with a short learning curve like QARA Enterprise, a product of The Digital Group. The technology used in the application you’re testing as well as the platforms and/or browsers the software is designed to work on. For example, if it is a web application you’re testing, a tool that supports web application testing alone, will be the best choice and will reduce the costs of investing in a more comprehensive tool. The testing goals of your organization or the results you seek from the implementation of automation. It’s important to note that not all applications you are developing would require the implementation of automation testing to the same extent. So, it is recommended that you start with building a plan and this is where the automation architect can help you. Every application should be thoroughly analysed to figure out which ones require automation to the maximum extent. Applications that require repeated test case executions with a high requirement for regression testing should be at the top of the list. This stage also includes the creation of the automation framework by the architect, which is nothing but a set of rules for writing the test scripts, so as to bring the requirement of maintenance to a minimum. Also, the scripts should be written in a way that they have the ability to cope with minor changes in the application without the need for re-writing them. Once the framework is in place, the next step is to plan for its hassle-free execution. This involves making a choice of the environment for the execution of test cases and this refers to operation systems like MS Windows, Mac, and Linux and browsers like Chrome, Opera, IE, Firefox, etc. and their various versions, along with defining the set of hardware configurations required. Say, an application is to run on Android and iOS alone, then it is sufficient to write scripts for these 2 platforms alone. This stage requires meticulous planning and also involves assigning the task of test case execution to a specific team. Writing the test scripts is key because they form the backbone of the automation testing process. Here are some points to note when writing test scripts to prevent code loss and improve productivity. Maintenance of a proper naming convention consistently. Maintenance of source code in a source control. Maintenance of version history and version control. So your automation testing tool is up and running. What next? Well, one you have the process in place, it is important to ensure the management is in the loop about the performance of the automation testing process. New age automation tools have the feature of auto-generated test case reports built-in, so your team won’t have much to worry about in this regard. These reports will allow you to analyse the performance of test case execution, the errors, the gaps, and the failures. Reports make it easy to work on improving the automation testing process, as one is aware of the areas to focus on. They also indicate whether the process is going on as planned. Following the steps discussed above will help you in successfully implementing automation testing seamlessly in your organization. Once the process is in place, you need to follow the best practices. Whenever there is a change/update in the application, the scripts should be checked and updated as required. Have you tried introducing automation to your testing process? Share your experience in the comments below.